It will take all of Raphael and Ice’s combined skills to restore the government of Alleven to its rightful ruler—and stay alive. The Prince He Loved by Michael Barnette, available from Dreamspinner Press. Prince Raphael d’Alleven flees for his life after his family is murdered and the government of Alleven is taken over. Exhausted and unable to find a way off world, Raphael literally runs into his best hope for salvation: a genetically engineered soldier named Hadrian Ice. Ice hadn’t planned on taking service with anyone, but understanding the predicament Raphael finds himself in, Ice is unable to turn him away. With bounty hunters on their trail and Vicount Alfonso Macchoine, scion of the House responsible for the coup, joining the hunt, it will take all of their combined skills to restore the government of Alleven to its rightful ruler, Raphael’s missing twin sister, Raphaella. As long as they don’t get killed first. Frankie and Johnny’s passionate love affair falls apart when Johnny refuses to admit two men can be in love in the Civil War South. Where My Love Lies Dreaming by Christopher Hawthorne Moss, available from Dreamspinner Press. Vic sees his face in a mirror—but it’s a ghost looking for reincarnated love. Vic then meets Jules and finds himself torn between the two. The Mirror by Bell Ellis, available from Dreamspinner Press. When Vic Ledore buys an antique mirror only to find it’s haunted, his initial fear turns to intrigue when he realizes he and the ghost wear the same face. The mirror is possessed by Philippe Montmarche, a vagrant who lived in early-1800s New Orleans and committed suicide after his lover went to war and died. Philippe is helplessly trapped until he can find his true love again. He also believes Vic is his reincarnation, but Vic isn’t so sure. Soon after, Vic meets Jules Cassell, a gorgeous, witty, interesting man who relieves Vic’s ennui and quickly finds his way to Vic’s heart. But Philippe has captivated Vic as well, and when Philippe’s search to find his lover mysteriously involves Jules, Vic can’t help but be drawn in to the tragic love story as he hopes to discover his own. New roommates make a pact: Justin will help Mark find a man, and Mark will help Justin find something he loves more than baseball. What There Is by Kate McMurray, available from Dreamspinner Press. Everyone thinks Aaron has it all—looks, money, fame, and success beyond measure. But all he really wants is Duncan. Parting Shot by Mary Calmes, available from Dreamspinner Press. Graham needs a miracle just to talk to a man. 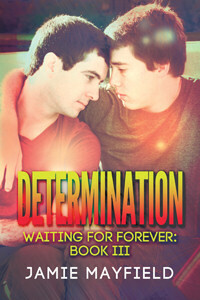 A wizard helps, but Graham doesn’t want Mark to fall in love with him because of magic. You’re the One by Gene Taylor, available from Dreamspinner Press. Intimidated by the clubs and cabarets of 1970s Chicago, shy English teacher Graham Thomas needs a miracle just to be able to talk to a man. When help arrives from a Robert Redford look-alike wizard, Graham brushes him off—he’s obviously certifiable. Or so Graham thinks until he tries out a popular song title as a come-on line and everything changes. Given the power to make others fall in love with him, Graham begins to enjoy the nightlife. But when he misuses his gift, he finds himself with accidental and unwanted suitors, including the senior dean at his school, a ticket-mad cop, and a rich young banker. Then Graham meets Mark Matthews and finally faces the moral issue of whether it’s fair to use magic to make someone fall in love. It would be so easy….